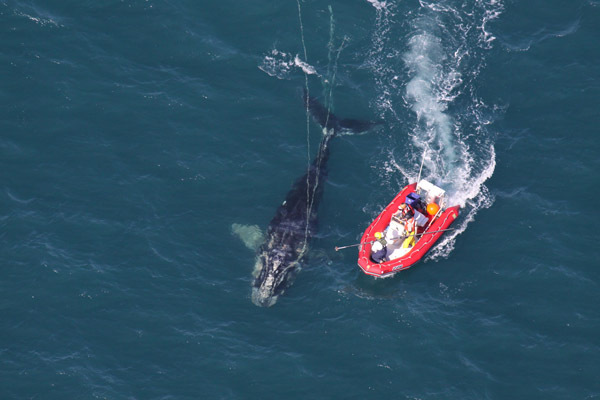 Entanglements in fixed fishing gear continues to be a serious concern for this small, endangered right whale population. Scientists from NOAA Fisheries Service approaching a young North Atlantic right whale they disentangled on January 15 off the coast of Cape Canaveral, FL. Photo via NOAA, credit: With permission from EcoHealth Alliance. Over the course of the past five months, three right whales have been seen carrying gear: Catalog #1503, a reproductive female who was seen one day in September on Jeffreys Ledge with rope entangling her head; Catalog #3120, a male born in 2001 who was also seen on Jeffreys Ledge in October entangled in gillnetting either in mouth or around flippers (this animal also suffered a serious entanglement in 2002) and the most recent case, a two year old female, the 2009 calf of Catalog #2611. She was sighted on Christmas Day down in the southeast U.S. severely entangled with gear through her mouth and around her flippers and trailing behind the body. 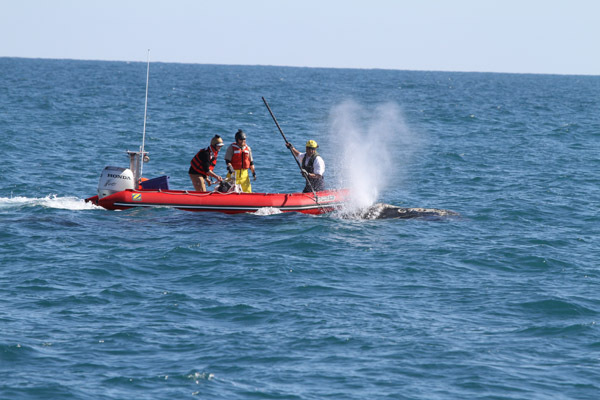 The first animal has not been resighted and the second animal has only been sighted far from shore so no disentanglement attempts could be mounted and their fate is uncertain. The third animal was recently the focus of a complex sedation and disentanglement effort detailed in this press release from NOAA. We don't yet know if this two year old will survive. She is very thin and sustained injuries from her entanglement and may have gear still remaining on her flippers. 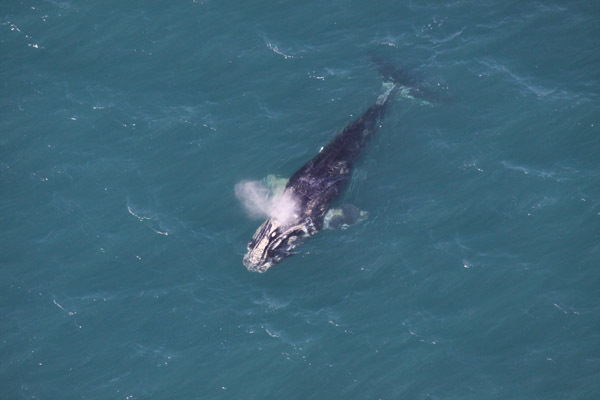 But the monumental efforts taken to free her using all tools available underscores the need to first, try to save all right whales in imminent danger of dying from human activities, and second, to quickly and effectively put changes in place that will eliminate these dangers. Both of these are challenging to accomplish but there is a concerted effort on several fronts to do so. Here is a short video of those monumental disentanglement efforts on the open seas.